KIEV, Ukraine -- Water contaminants from a toxic discharge from an aluminum plant in Hungary have reached Ukrainian waters, scientists discovered. Scientists at the Ukrainian Scientific Center for Sea Ecology found that polluting agents from an October industrial accident reached Ukraine, the National News Agency of Ukraine reports. Toxic sludge reached a tributary of the Danube River after leaking from a chemical plant about 100 miles west of Budapest. The plant held toxic byproducts left from the conversion of bauxite to aluminum. 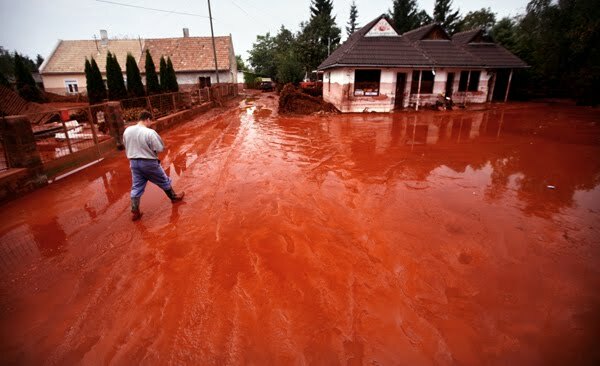 Around 24 million cubic feet of toxic red mud covered Hungarian buildings in October, leaving at least seven people dead and injuring more than 120 others. The Hungarian government declared a state of emergency in three counties close to the spill and authorities suspended work at the aluminum plant. Ukrainian environmentalists reported that the level of contamination in area waters was considered high but not critical enough to warrant an extreme threat to public health. The cost of capitalism. The environment is usually the victim; so are the poor and voiceless!